When you fancy a change from a ‘big name’ galleries of Central London, Camden will be the perfect place to look. Renown for being a backdrop of huge number of artists and creatives it’s not surprising that Camden contains one of the highest numbers of art galleries out of the London Boroughs. The exciting part is that there, the art scene is constantly changing meaning there’s always something new to explore. Today I am attending the Private view at the COB Gallery, a new artistic hub in Camden, located very close to world famous, always buzzing Camden Market. 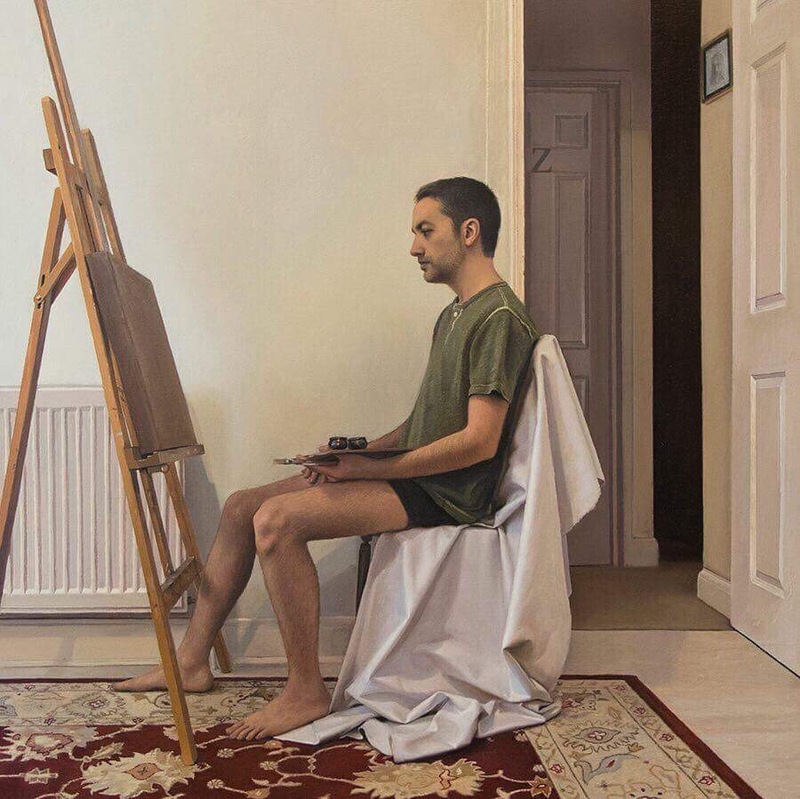 I am to meet Raoof Haghighi, who is exhibiting 18 of his painting and drawings at the show.Born in Iran, he is a self-taught artist who has now made London his home. Also, ever since his first appearance at BP Portrait Award at 2011, his work has found home at the most prestigious competitions every single consecutive year. His list includes as follows: BP Portrait Award 2011, 2015 and 2017; Threadneedle Prize 2012, 2013, 2014; Royal Society of British artists 2014, 2015, 2016; Royal Society of Portrait Painters 2014, 2015, 2017. 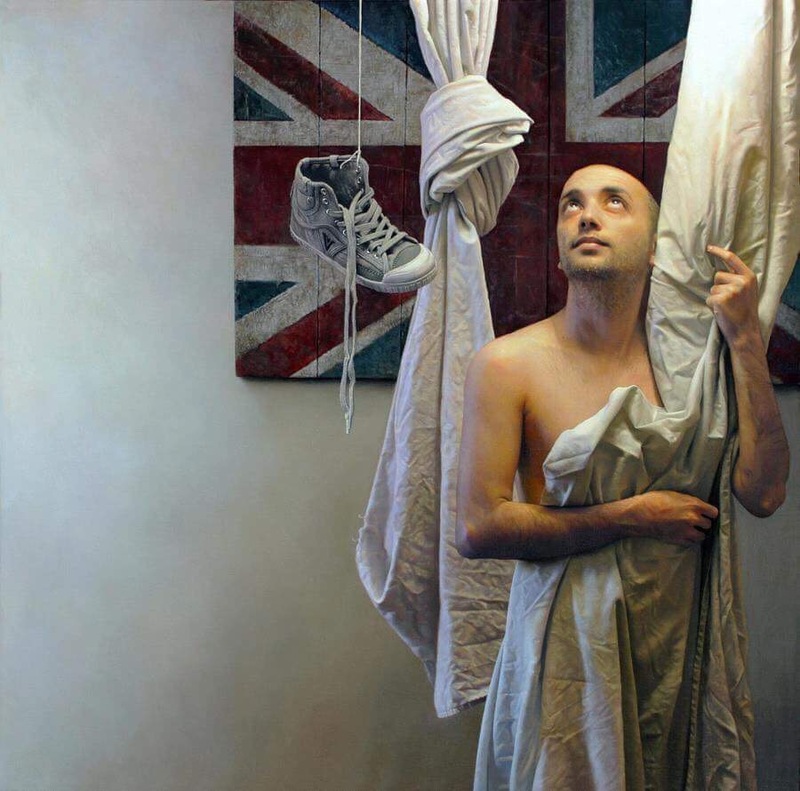 He was also chosen Overall Winner of Artist of the Year 2011 by Artist & Illustrators, the UK's number 1 magazine for original art; Sky Arts Portrait Artist of the Year 2014 by Sky Arts - as featured in Sky Arts TV. This year, besides from scooping National Gallery, he also landed Winner of the Gold Memorial Bowl award for best miniature work in the exhibition at the Royal Society of Miniature Painters. When he comes to greet me, Raoof does stand out against the backdrop of noisy crowd of London hipsters: he is poised, impeccably clad, soft spoken and well-mannered. We walk around looking at his work, and because just a few of his paintings are large, one really needs to come close to appreciate the fine detail. There is plenty of fine detail to appreciate both in paintings and drawings; although the drawings are quite incredible in that regard considering the tiny size, almost closing up on being miniatures. The prevailing mood of his paintings is that of solitude and quiet contemplation. The people in portraits seem to avoid a direct eye contact with the viewer, the solitary figures are either turned away or completely absorbed by their own world. The solitude is self- contained and somehow very compelling, as if the viewer is welcomed to join the silence in order to have the conversation. However, I also notice that there is a variety of technique and subject-matter in his body of work, so I have to ask about the idea behind the show. Raoof explains that he merely wanted to show a range of the works with focus on realism; starting with the work that was done at the age 22 and on to the recent miniature. However, it doesn’t point the direction to where he wants to be in the future. 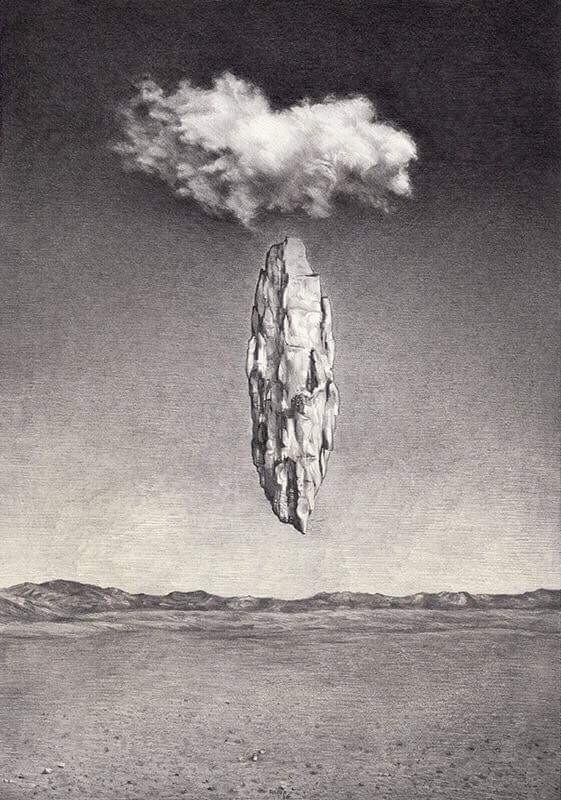 Although his work is consistent in broader sense of being figurative, he doesn’t think it is important to pursue the consistency of the concept or even the technique when he works. He is not afraid that the style and the theme of his work might for that reason not be easily recognizable as works of, for example, John Currin. He doesn’t want to do what every curator would tell him is important - he is most interested in being versatile, being free to turn to the expression that interests him at the moment. His driving force is to find many different ways to surprise himself. Since my question about how long time it took to make the show became obsolete, I ask instead whether he spends a lot of time on each painting. Turns out that differs greatly too: 50x50 cm ‘Magnetic Field’ took 6 months to complete, while technically similarly looking ‘Doubt’ took just one day. While he is doing one painting, he is not working on other paintings until that is complete - unlike artists like myself who are usually working on several pieces simultaneously. However, he does a lot of drawing and experimenting with other techniques while completing one particular piece. What about his approach to the process of painting itself? Every artist has a certain way of working they prefer. I like to plan my paintings, start with background or overall tone first, work in layers - and take my time. Others have an immediate approach, work very fast and go with the flow. Raoof, not surprisingly, doesn’t follow a particular routine here either. Sometimes, he laughs, he diverts so much that he almost forgets how the previous painting was made. So instead of trying to repeat his successes, he approaches every new painting differently. Raoof tells me that the only form of the routine he has is that he likes to work early in the morning. While he tells me that he goes to the studio immediately after he wakes up, I am looking at his two self- portraits at the studio and remark that perhaps explains the underwear as his studio attire on both portraits. It didn’t look like something out of place in my eyes - after all, I have seen stranger things being worn by artists while at work. However, that wasn’t a true description of reality; turned out that he found painting legs and joints by far more interesting than painting jeans he usually wears while working. So much for artistic eccentricity, then. Returning to his love of variety of expressions, Raoof believes that it comes from the fact that he had many interests as a child: science, architecture, music. Although painting and drawing will always be best way to express himself, he also plays five instruments, makes animations and enjoys learning about new scientific inventions. Not unexpected, he mentions Leonardo da Vinci as someone who continued to inspire him through his entire life, mostly as inventor. He also names Vermeer and Wyeth as some of many artists that have influenced him. When it comes to inspiration behind his own work, it happens that he turns to his own dreams; but mostly he is inspired by the process of work itself, by the the discoveries and thoughts that appear during creating. The current work inspires the next one, like an unbroken chain or path that reveals itself while you are simply walking. Talking to Raoof and contemplating his paintings, I came to make a small discovery of my own: a work of an artist, as indeed even life itself doesn’t necessarily have to be presented with a consisted theme. A theme is great when it comes to writing a novel, but a story can also be told through an impression, like haiku. That is exactly the impression I am taking with me after seeing Haghighi show -those are small pieces of exquisite work that might or might not create a story, but they do create a mood, a connection and a kind of understanding that doesn’t always come through words. The exhibition lasts until 10.12.2017. Dec 5 IS IT UNSAFE TO LOOK AT DISTURBING ART?